AT&T (T) just announced its first move to optimize WarnerMedia’s advertising platform. According to a Reuters report. Moreover, AT&T recently provided an update on its strategy following the acquisition of Time Warner, now known as WarnerMedia, as well as guidance for 2019. 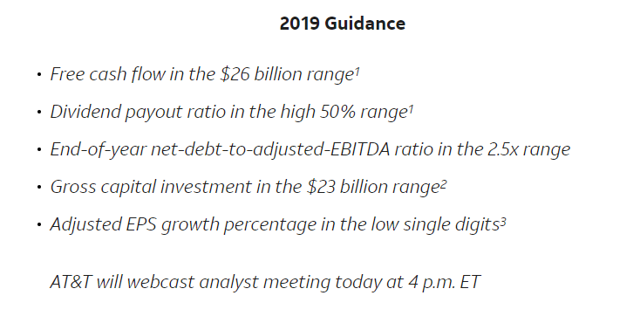 Guidance includes significant expected growth in free cash flow, which will help the company achieve its target of a debt ratio in the 2.5x range by the end of 2019, as well as a low single digit growth rate in adjusted EPS. This is great news. The 2.5x debt to equity range by the end of 2019 guidance was ahead of plan. This led to several analyst upgrades and may lead to a Moody’s rating upgrade. The following is our bull case. “Just a little more than six months after coming together under the AT&T umbrella, WarnerMedia’s Turner and AT&T’s advertising business Xandr are working together to improve the relevancy of advertising, fueled by data and content connections. Making advertising matter and more relevant to consumers are among the greatest challenges facing the industry today. Turner and Xandr are bringing together a unique set of assets—valuable consumer data and insights, advanced advertising capabilities and engaged passionate fanbases—all in service of marketers who want to make a real impact, and for consumers who want better experiences. So the combined entity will hold nearly one trillion ad impressions per year. This is incredibly astounding to me. Here’s the kicker. Stephenson states AT&T will be able to monetize Time Warner’s 750 billion ad impressions at two to three orders of magnitude higher. Now let’s turn our attention to the debt. Moody’s is focused on AT&T’s “willingness and ability” to reduce leverage back toward 3 times. Furthermore, Moody’s is paying attention to the company’s free cash flows and liquidity levels. Moody’s also is reviewing the degree of subordination of the notes post-merger. The following are AT&T’s positive and negative attributes according to Moody’s. Stability, scale and diversity of revenues. Market leader in nearly all of its businesses. Contains valuable assets with predictable revenues and healthy margins. Consistently investing for the long term. “Judge Richard Leon of the United States District Court for the District of Columbia (DC District Court) ruled in favor of AT&T’s merger with Time Warner on June 12, 2018, in a 172 page rebuke of the Government’s case. Judge Leon ruled that the Government failed to meet its burden to establish that the proposed merger with Time Warner lessened competition substantially, and allowed for the merger to proceed without any conditions attached. A three-judge panel at the US Court of Appeals for the District of Columbia Circuit (DC Circuit Court of Appeals) will now consider the DOJ’s argument that Judge Leon was incorrect in his judgment. So there you have it. Either the Time Warner deal produces results with AT&T increasing cash flows and reducing leverage or the DOJ appeal causes an issue and free cash flow goes negative and leverage remains above 3 times debt to equity. It looks like they are going to pull it off to me. Now let’d take a look at the analyst meeting highlights. “The stock is cheap on multiple metrics,” analyst Colby Synesael says, saying the company appears to have a credible plan to get to EBITDA stability in its Entertainment group, the dividend looks safe and a “still unproven” advertising strategy still could drive significant upside to come. “We are well positioned for success as the lines between entertainment and communications continue to blur. If you’re a media company, you can no longer rely exclusively on wholesale distribution models. You must develop a direct relationship with your viewers. And if you’re a communications company, you can no longer rely exclusively on oversized bundles of content. We have some of the world’s best content and 370 million direct-to-consumer relationships across mobility, video, broadband and our digital properties. That exceptional combination enables us to deliver a broad spectrum of entertainment experiences — from premium video to skinnier over-the-top and mobile-centric bundles of live content, and a subscription video-on-demand product to launch late next year. And with Xandr, our advertising business, we’re using insights from our customer relationships, combined with our large advertising inventory, to drive higher yields on advertising. AT&T went over 2019 guidance at the meeting as well. 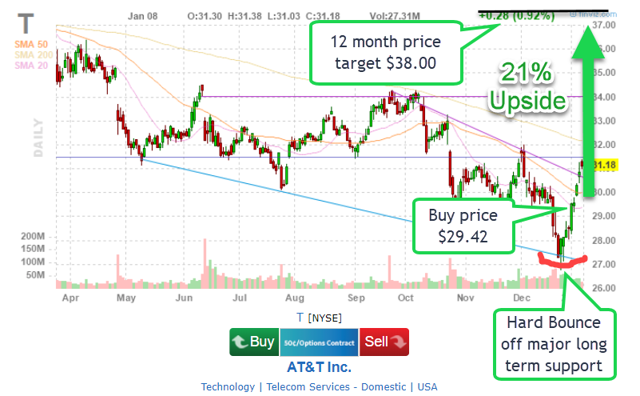 AT&T is trading for a significant discount to its peers and the market. 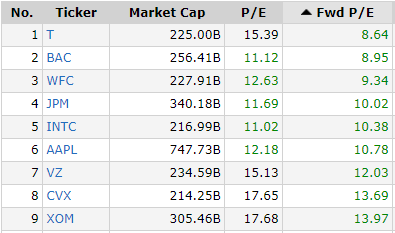 AT&T is actually the cheapest mega cap in the S&P 500 right now with a forward P/E ratio of 8.64. Furthermore, JPMorgan Chase raised its rating for AT&T shares to Overweight from Neutral, citing the wireless company’s low valuation. Cusick reaffirmed his $38 price target for AT&T stock. In similar fashion, Cowen analyst Colby Synesael upgraded AT&T to Outperform from Market Perform. “We think (AT&T‘s) plan laid out to get to Entertainment Ebitda stability appears credible, the dividend is safe and the stock is cheap on multiple metrics,” he wrote on Monday. Synesael raised his price target for the stock to $36 from $34. My 12-month price target is $38 implying a 21% upside from current levels. Now let’s take a look ate the important part, the dividend. 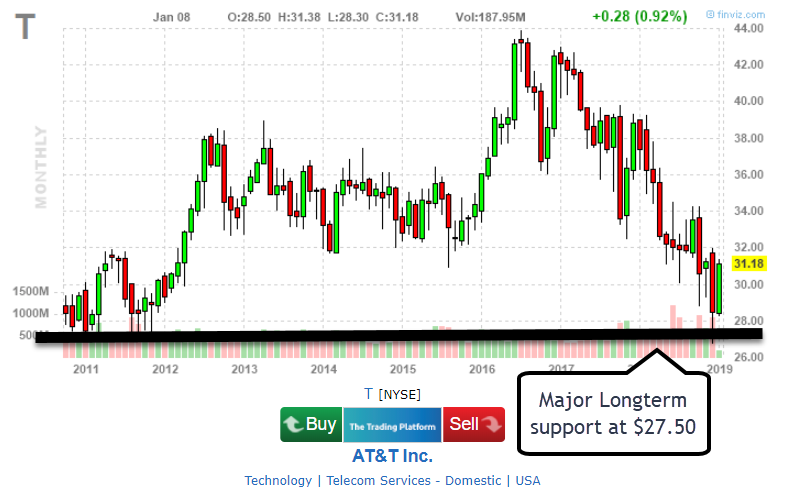 AT&T is a Dividend Aristocrat that has increased the dividend in each of the last 33 years. The payout ratio is in line at 57%. The company’s cash flow from operations is highly predictable and substantial. Even so, AT&T’s big bets on DirecTV and Time Warner definitely need to pay off. Now let’s turn our attention to the technical status. The stock just bounced off long-term support. I see major support at $27.50. For those of you who like to set tight stops this would be my initial level. My 12-month price target is $38.00. I have been behind the AT&T/Time Warner acquisition from the start simply because it looked like the right thing to do from an operations perspective. If AT&T is going to pay billions of dollars to build out the network so everyone, everywhere, on any device can access and consume content, the company might as well own it and reap the lion’s share of the profits. I say this opportunity will go a long way to decreasing the debt load that so many have espoused will be the end of AT&T’s dividend. Furthermore, the stock is trading at a rock-bottom valuation. CEO Stephenson has provided shareholders another solid reason to sleep a little easier at night. What’s more, the revenue-boosting characteristic of the Time Warner acquisition should be easy to implement. The increased revenue streams seem to be coming on-line sooner rather than later. The recent update has increased visibility. Add to this the recent corporate tax reform and regulatory relief, and you have a recipe for success. I say the worry about the combined entity’s debt load may be fading. The combined entity’s ad revenue will be significant and orders of magnitude higher than before with the integration of AT&T’s customer base to Warnermedia’s content. The last and most important hurdle will be the DOJ appeal. Previously, I felt the DOJ would not take AT&T to court because I was sure they would lose. They did. Then I was sure they would not appeal due to the time of ruling the Judge provided. The DOJ still appealed. I don’t see how they will be able to win the appeal. yet, it still looms large in the near future. The stock remains a solid long-term buy with its well-earned Dividend Aristocrat status. I believe many people are vastly underestimating AT&T’s prospects for growth when fully integrating WarnerMNedia. One thing is for sure, AT&T is definitely worth more today than it was yesterday. I was a consultant/auditor for Bell South in the 1990s. What’s more, AT&T is a hometown stock for me. I grew up in San Antonio, Texas, the birthplace of modern day AT&T. I can tell you from my experience with the company I believe it can and will achieve its goals. The fact of the matter AT&T is, and has always been, at the forefront of most new communications systems, and the company still owns the last mile in most marketplaces. I also was a consultant/auditor for Time Warner in Atlanta in the late ’90s while working for Ernst & Young. I believe the two combined will be highly synergistic and continue to provide a boost to the bottom line. 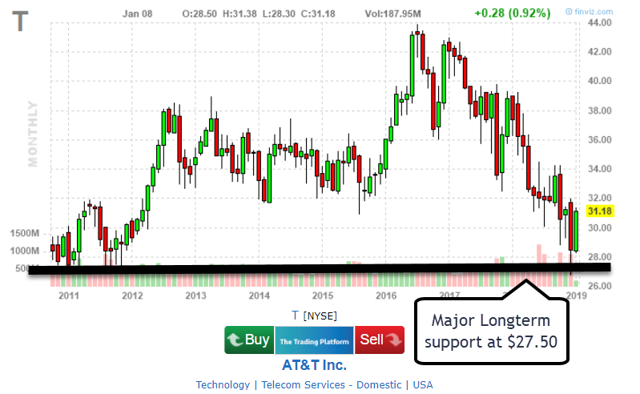 The fact is AT&T’s growth prospects have increased substantially. AT&T is transforming from being primarily a widows and orphans stock to a dividend growth/total return play. Nonetheless, don’t expect any big upward moves in the stock price until the company puts the Time Warner acquisition behind it. AT&T needs to prove it can make more money despite the added debt load and revenues from wireless services waning. Nevertheless, it’s always darkest before dawn. Those are my thoughts on the matter, I look forward to reading yours. 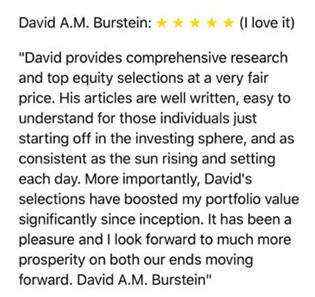 If you enjoyed this article please check out Discovered Dividends! Discovered Dividends is a highly rated top performing service with 22 5 star ratings. We are currently offering a FREE TRIAL at the legacy rate of $49/month or $399/year to the next 50 new members! At the current pace, we expect to reach the limit quickly. The Quality High Yield Retirement portfolio currently yields 8.36% and is outperforming the S&P 500 by nearly 5%. Check it out!! You have nothing to lose and everything to gain! Look forward to hearing from you!